Jim Chanos, a big Tesla short-seller, is once again talking down the company’s stock. He made valid points, but he’s overlooking Tesla’s increasingly strong core business. Tesla looks as if it will always have high-cost, high-profit luxury vehicle sales to fall back on. Noted Tesla short Jim Chanos is back on the attack. According to Bloomberg’s David Welch, the contrarian investor and head of Kynikos Associates said Tesla CEO Elon Musk is presiding over an insolvent company and will be compelled to leave in a few years to focus on SpaceX and its march to Mars (assuming that Tesla and SpaceX don’t wind up merging). Chanos has gotten burned on his short position, at least in the medium term, as investors brushed off scepticism about a tie-up with SolarCity last year and sent the company’s shares to new heights in early 2017. And he has a reasonable thesis: After all, Tesla has been around for 14 years and has rarely posted a profit. In the third quarter of this year, the company posted its largest ever loss, as it burns capital to launch its Model 3 sedan. 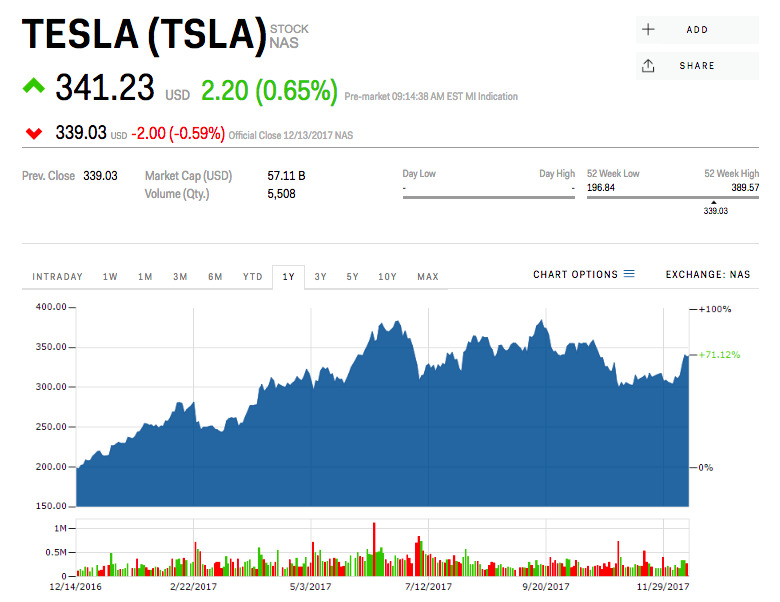 The only way to keep that train running is to return to the market to raise additional cash, something Tesla has done reliably over the past two years. But like many shorts, he doesn’t seem to realise that Tesla, apart from the newly incorporated solar business, is essentially now two companies as far as the car part goes. The Model 3 side is about the mass-market and taking on the Fords, Toyotas, VWs and General Motors of the world. But the established business of selling $US100,000 luxury sedans, SUVs, and soon a new sports car is more in line with Audi, BMW, and Mercedes – and on paper could be quite profitable. This is Tesla’s life raft. If everything goes wrong with the Model 3 – and even if it goes right, there’s no guarantee that Tesla will be able to achieve a decent margin in the vehicle – the company could always fall back on the luxury cars, which would appear to be a 100,000-unit-per-year undertaking throwing off something like 15%-20%. That company wouldn’t be worth $US50 billion, but even Musk would admit that Tesla’s lofty market capitalisation is illogical. But it could be worth half that, and although latecomers to the stock would indeed get scorched, anybody who got in around 2011 would be up a massive amount. Reading Chanos’ remarks, I often wonder what’s really going through his head. Sure, he’s right that Tesla is wildly overvalued. It could be in for a fall. But once it lands, and if the business is then correctly valued, it has great growth and profit potential. Maybe then he’d be a buyer?